Within the Gothic Revival, architects, most notably A. W. N. Pugin and G. E. Street, had promoted embroidery with the vigorous conviction that it was a vital and serious practice. Many of the finest vestments and other embroidery of the Gothic Revival were architect-designed, but it is often forgotten how often the makers' art was valued.... By the 1890s, with the impact of art-school training, embroidery, especially at the Glasgow School of Art, became an experimental, innovative craft. — Lynne Walker (126). [Thomas] Wardle's wife, Elizabeth, also is worth attention. A lot of women worked in the [textile] industry, but a more genteel pursuit was embroidery, particularly in making tapestries and banners for churches. Sometime around 1879, Thomas and his wife Elizabeth set up the Leek Embroidery School. — "Thomas Wardle"
Crane, Walter. “Needlework as a Mode of Artistic Expression. Complete text. The International Studio 22 (1898): 144-48, 197-202. Transcribed from the Hathi Trust Digital Library online version of a copy in the library of University of Chicago. 22 January 2018. "Elizabeth Leeke Wardle." Geni. Web. 26 January 2016. "St Edward's Church, Leek." Staffordshire Past Track (Staffordshire County Council). Web. 26 January 2016. "Thomas Wardle." Stoke & Staffordshire Local History (BBC archives). 6 January 2016. Walker, Lynne. "Women and Church Art." In Churches 1870-1919. Studies in Victorian Architecture & Design (The Victorian Society). 3 (2011): 121-43. Walton, Cathryn. 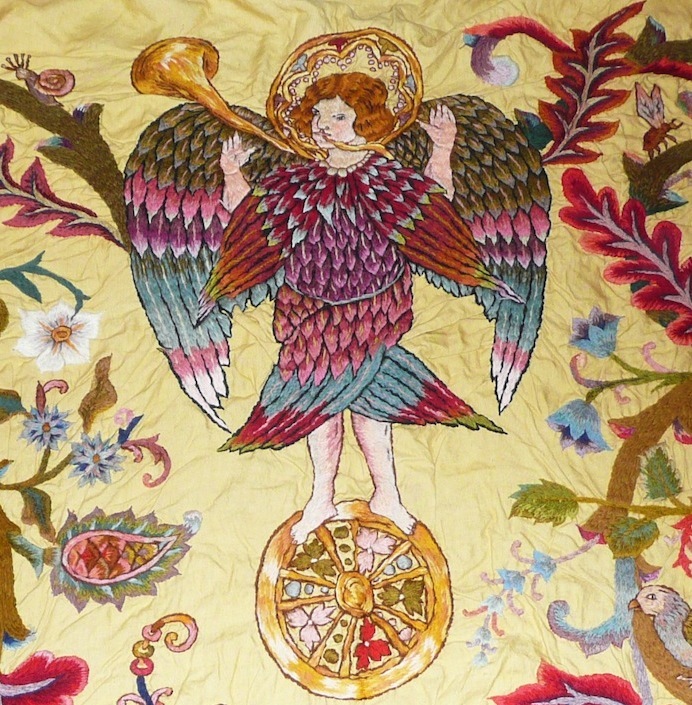 Hidden Lives: Leek's Extraordinary Embroiderers. Leek: Churnet Valley Books, 2014.